Cheetos are headed to the big screen, and it’s not an animated movie starring Chester Cheetah. 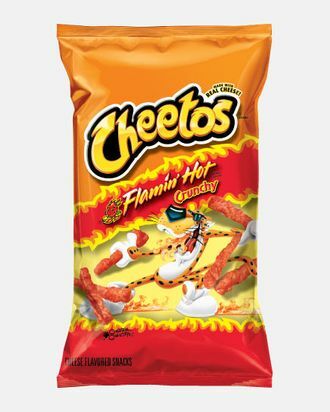 In what Variety terms a “highly competitive sale” in which “multiple studios [were] vying for the project,” Fox Searchlight has gotten the rights to produce a film called Flamin’ Hot, about the eponymous Cheetos flavor’s true-life creation story. The name alone will engender plenty of eye rolls, but it’s actually a serious biopic. It’s about Robert Montañez, the janitor who invented Flamin’ Hot Cheetos by mistake, then persuaded Frito-Lay to make them. The Mexican-born immigrant moved to California as a kid, struggled to learn English, and eventually dropped out of school. He picked grapes on SoCal farms for a while, before winding up at Frito-Lay’s Rancho Cucamonga plant in 1976. He did, and everybody — family, friends, even co-workers — said he’d vastly improved normal Cheetos. Enough people were raving that he scored a sitdown with Frito-Lay’s president, who gave him two weeks to prep a presentation for company execs. Montañez copied a marketing strategy he and his wife found in a library book, bought a $3 tie his neighbor had to knot, and even constructed a bag mock-up, because he’s “a little bit of an artist.” That was pretty much that — Frito-Lay had a ready-made billion-dollar snack. Frito-Lay promoted Montañez up the corporate ladder, and today he’s executive vice-president of multicultural sales at parent company PepsiCo, and seems to have received the nickname “godfather of Hispanic branding.” So, a biopic with a happy ending where delicious Mexican street food meets immigrant success story sounds pretty good — almost as good as a bag of spicy, dusty Flamin’ Hot Cheetos.